While the masses head to Barceloneta Beach, those in search of quieter shores take their towels to Nova Icària Beach. 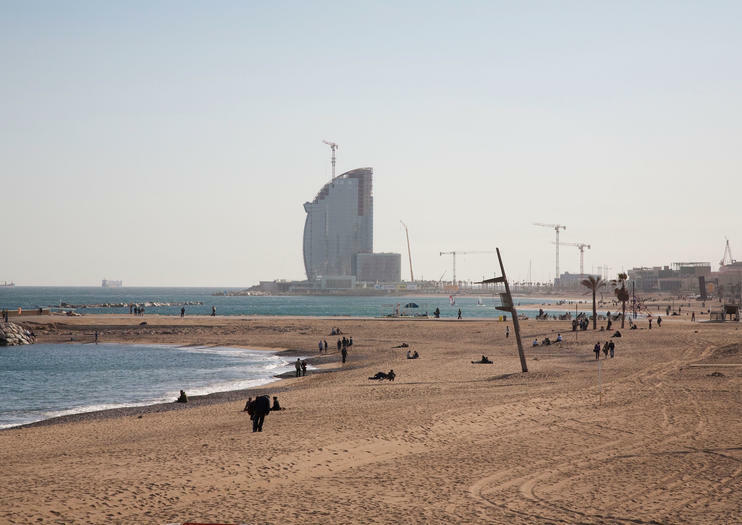 Located between Bogatell and Barceloneta Beaches, this quarter-mile-long (400-meter-long) stretch of sand is backed by a wide promenade and the Port Olimpic neighborhood with its abundant restaurants. Nova Icària Beach, popular among locals, is also one of the city’s best beaches for water sports. Try your hand at windsurfing with a lesson from the beach, or head out into the water for some kayaking or stand-up paddleboarding (or both). For the best view of the beach, take a sunset sailing tour from Port Vell; you’ll see the beach, and much more of Barcelona’s coastline, as you sail. If all that activity works up an appetite, the beach is home to several seaside seafood restaurants, known as chiringuitos. Nova Icària Beach is a good choice for families and those looking for a quieter beach experience. The beach has showers, lifeguards, bathrooms, and umbrellas for rent. Don’t forget to bring sun protection, as there’s not a lot of natural shade on the beach. While Nova Icària Beach can be reached on foot, those that don’t wish to take a long walk may prefer Metro, public bus, or hop-on hop-off bus. Nova Icària Beach is at its liveliest in the summer, particularly during the month of August when many Europeans take their vacations. If you’re hoping for a quieter stretch of sand, plan to visit between April and May or September and October, when daytime temperatures remain warm but crowds have thinned out. Sun seekers in Barcelona have plenty of choices for where to lay their towels. Barceloneta is the liveliest and most accessible to the Old City, while Bogatell draws a quieter, more mature crowd. Mar Bella, popular with locals, is also home to a nudist-friendly stretch of sand, and Ocata Beach, just outside the city, is quite calm even at the height of summer.